A French teacher vacationing in Cannes meets a bunch of random people who have unresolved drama with each other. It's a weird sensation with you're watching a movie and suddenly realize it's about absolutely nothing and that it's going absolutely nowhere. While watching something of this nature, one may start to question, "why in the hell am I watching this?" 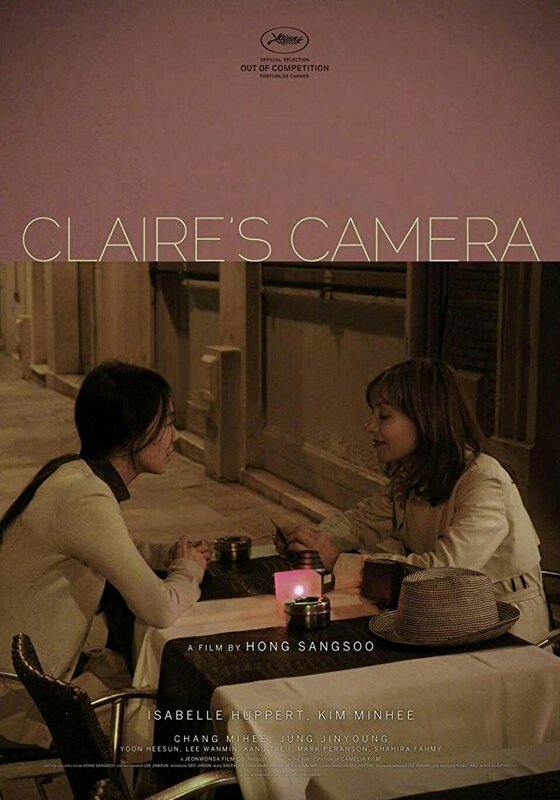 That's exactly what happened as we viewed writer/director Sang-soo Hong's "Claire's Camera." The film stars Academy Award nominated actress Isabelle Hubbert as the titular Claire, who is vacationing in Cannes during the Cannes Film Festival. Joining her is Min-hee Kim, who we know from one of our favorite films of 2016, "The Handmaiden." She plays Jeon Manhee, who sells movies to distributors during the festival, though she had just gotten fired because her boss has an unexpressed personal issue with her. Claire roams around Cannes and strikes up conversations with random people as she goes about her days. She also asks each person she encounters if she can take their photograph. She happens to come across Manhee, her boss, and the man at the center of their conflict, So Wansoo, played by Jin-young Jung. We watched "Claire's Camera" and initially wrote it off because we figured it was made by an inexperienced director working with a micro-budget who was lucky enough to somehow get two accomplished actresses to star in his film. We assumed this, in large part, due to the quality of its camerawork, its overly long transitions, its painful and unnatural flow, and the fact that Isabelle Huppert wears a hat with a tight stripe pattern which did not agree with the cameras used to film the picture. It turns out, Sang-soo Hong is a very capable and seasoned filmmaker. He has been working over 20 years and has 25 directorial credits under his belt. If this film is any indication of his quality of work overall, it doesn't particularly make us want to seek out more of it. This is a slice-of-life movie, which is fine if the characters and dialogue are interesting and the overall subject is explored well. That is simply not the case here. The dialogue is banal, the characters are bland, the situation isn't remotely interesting, and there is no real insight into anything whatsoever. This is a "nothing" movie that looks like it was made in one weekend because the director wanted to kill time in between screenings and parties at the Cannes Film Festival. It's as if he decided, "hey, why not shoot a movie in my downtime? Isabelle Huppert is here promoting "Elle" and Min-hee Kim is here promoting "The Handmaiden," so let's get this going! bing-bang-boom-done." We nearly fell asleep watching "Claire's Camera." It's a pointless, ineffective, dull arthouse film that's a task to get through and is an exercise in how not to make a movie.